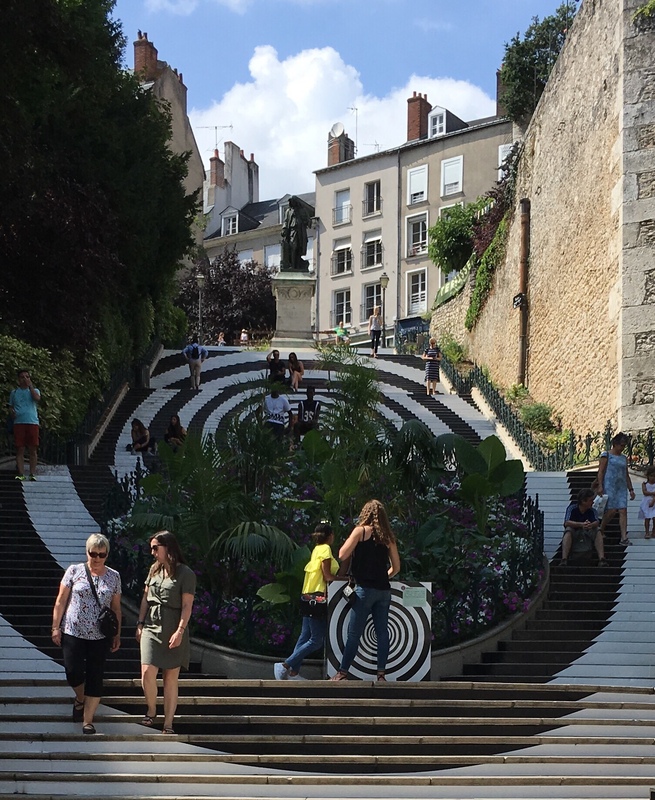 I’ve been trying to get a photo of the Denis Papin stairs in Blois since I got back from holiday but the light is never right when I’m there. I took this from the car today! J’essaie de prendre une photo de l’escalier Dénis Papin depuis notre retour de vacances mais ce n’est jamais la bonne lumière. Aujourd’hui j’ai enfin pu prendre celle-ci depuis la voiture. Tagged: escalier denis papin blois. Yes I had a couple of go’s at this and I’m not really that happy with the results there were always people in shot and every time I thought ok now, a car would come into shot so like a picture of Chambord without scaffolding on the roof it’s on my todo next year list. You may manage Chambord, but I think these stairs change each year :). Recently painted I guess. Very dramatic. As far as I know, it changes each year. Snazzy for a change. I wonder if there have been any trip ups or downs with people wearing progressive lens glasses? Have you seen the Citadel at Carcassonne with it’s summer and Tour de France bright yellow streaks? No, I haven’t seen the Citadel at Carcassonne this year – sounds exciting! You got them at the right time. There’s a staircase here that is painted each year- I think its best time of day for photography would be morning. I thought of that too, but the sun cast too many shadows in the morning!